Where can we find truth? I always encourage couples who are getting married to make a commitment to take a regular, in-depth look at their relationship. This doesn’t replace the ordinary, everyday talks – or even rows! They are times – perhaps three or four a year – to set aside an evening or weekend simply to talk about us. It’s an opportunity to discuss, listen, and give each other the right to raise any issue. When couples manage to have these ‘pit stops’ regularly, they usually find it’s easier to raise issues without either party feeling threatened. Those pit stops may hold some surprises. They may show that a fantastic father or mother needs to be a good husband or wife as well. They may reveal that one of the partners is beginning to feel ’part of the furniture’. And a couple may realize that unless they put an end to those sarcastic comments, the hurt caused will result in them drifting further and further apart. How can I help a friend or family member who has an addiction? A Somali lady in Kenya became a believer after speaking to Christian friends. Although fearful of being rejected by her community, she received a dream from the Lord in which He told her that the truth was more important than the respect of her community. After her conversion she had to leave home for her own safety. So what is the evidence for the resurrection? The so-called ‘swoon’ theory, that Jesus may have only fainted and revived in the cool of the tomb, does not hold water. It involves believing that a man beaten to within an inch of his life, impaled on a cross and then wrapped in 75 pounds of bandages and spices (rather like a plaster of Paris cast!) could somehow unwrap himself, push away a one ton boulder, single-handedly overcome an armed Roman guard; and then persuade over 500 others that he had conquered death. The foolishness of this position is evidenced by the fact that no-one dared suggest the possibility until centuries later. Would Christ, the model of integrity, really deceive his followers by claiming he had risen when he knew he hadn’t? Apart from the testimony of eye-witnesses, no non-Christian historian at the time (see Josephus, Pliny, Tacitus and Lucian) doubted that Jesus died. People who are unconvinced by the above usually have philosophical objections to miracles per se. Here, no amount of sound historical evidence will convince them. But in reality, the real miracle is the incarnation. Once we allow for the possibility that God exists and could become a man; then a resurrection presents no difficulty at all. It is then a case of reviewing the evidence. Ultimately, the fundamental block to belief in the resurrection is often not intellectual, but moral. In Jesus’ own words, ‘If they do not listen to Moses and the Prophets, they will not be convinced even if someone rises from the dead.’ (Luke 16:31) For those who choose not to believe, no amount of evidence will suffice. How confident can we be that Jesus Christ actually lived? The historical evidence for Jesus of Nazareth is both long-established and widespread. Within a few decades of his supposed lifetime, he is mentioned by Jewish and Roman historians, as well as by dozens of Christian writings. Compare that with, for example, King Arthur, who supposedly lived around AD500. The major historical source for events of that time does not even mention Arthur, and he is first referred to 300 or 400 years after he is supposed to have lived. The evidence for Jesus is not limited to later folklore, as are accounts of Arthur. What do Christian writings tell us? The value of this evidence is that it is both early and detailed. The first Christian writings to talk about Jesus are the epistles of St Paul, and scholars agree that the earliest of these letters were written within 25 years of Jesus’s death at the very latest, while the detailed biographical accounts of Jesus in the New Testament gospels date from around 40 years after he died. These all appeared within the lifetimes of numerous eyewitnesses, and provide descriptions that comport with the culture and geography of first-century Palestine. It is also difficult to imagine why Christian writers would invent such a thoroughly Jewish saviour figure in a time and place – under the aegis of the Roman empire – where there was strong suspicion of Judaism. On Palm Sunday, Jesus rode a donkey into Jerusalem in direct fulfilment of messianic prophecy (Zechariah 9:9), knowing the authorities would respond by seeking his arrest and execution. On Monday, he overturned the money changers’ tables, further provoking the wrath of his enemies. On Tuesday, he defeated them again and again in public debate. On Good Friday, the One whose power calmed raging seas and raised the dead allowed Roman soldiers to nail him to a cross. On Sunday ,The tomb where he was laid was empty. His face shone like lightning, and his clothing was as white as snow. Then the angel spoke to the women. “Don’t be afraid!” he said. 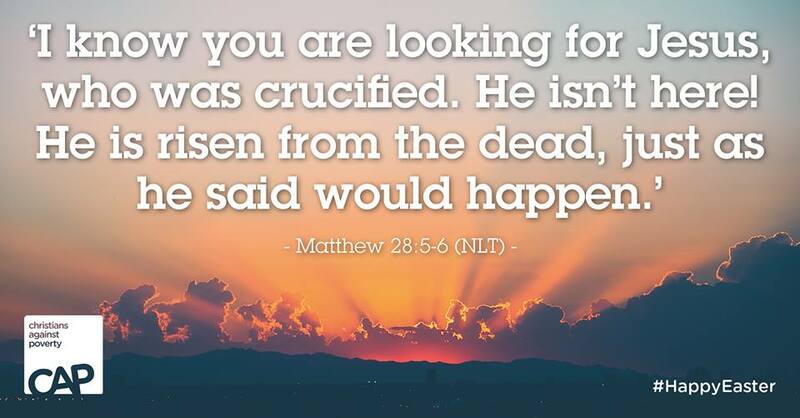 “I know you are looking for Jesus, who was crucified. He isn’t here! He is risen from the dead, just as he said would happen. Come, see where his body was lying. And now, go quickly and tell his disciples that he has risen from the dead, and he is going ahead of you to Galilee.